Photo: Herbert A. Dilg House, ca. 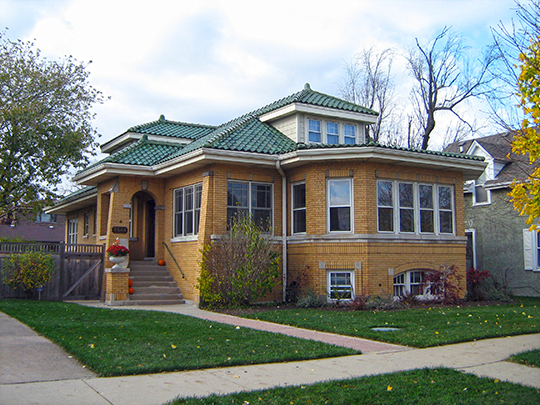 1925, 8544 Callie Avenue, Morton Grove, IL. Listed on the National Register of Historic Places in 2009. Photographed by User:Zol87 (own work), 2009, [cc-by-2.0 (creativecommons.org/licenses/by/2.0)], via Wikimedia Commons, accessed May, 2013. The Cook County Government Building is located at 118 North Clark Street, Chicago IL, 60602; 312-603-5500. Cook County was organized by act of the General Assembly, January 15, 1831, in the "winter of the deep snow," and included the present counties of Lake, DuPage, Cook, and Will. The county was named in honor of Daniel P. Cook, formerly Illinois representative in Congress. The little town of Chicago, not yet incorporated, was made the county seat. In June of the same year the Legislature granted the new county twenty-four canal lots containing land which had been given to Illinois by the United States to encourage the construction of a canal to connect the Great Lakes and the Mississippi. Part of these lots were sold to defray the current expenses of the new county, but eight lots were set aside for a public square to be always used for government buildings. This square is now the site of the Court House and City Hall and was originally a gift to the new county from Illinois. On this block of land was erected the first public structure, called the "Estray Pen," a small wooden, roofless enclosure, the first "pound." See Governmental History of Chicago, by Hugo S. Grosser. In the autumn of 1835 the first court house was built on the Clark and Randolph Street corner of this public square. It was a small one-story brick building with a basement in which were the county offices, while the court room, seating two hundred persons, occupied the floor above. That insignificant brick building, contrasted with the present five-million-dollar court house on the same site, is a symbol of the growth of Cook County in eight decades.